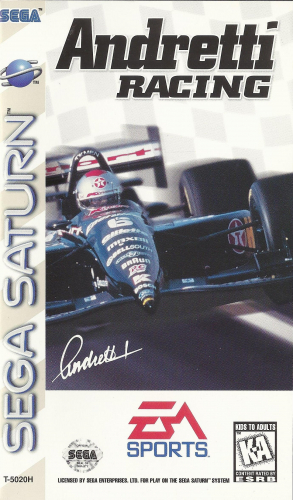 ANDRETTI RACING for the Sega Saturn allows you to experience the excitement of both stock car and Formula 1 racing. Imagine shooting through the turns on one of 16 real-world tracks at speeds approaching 200 mph. At these speeds, every track requires special skills to keep from slamming into the walls. But if you do happen to get up close and personal with the wall, your car will start to reflect the damage. If your car looks like a reject from a scrap metal sale, use the racing school and get advice from the Andretti family. After learning how to beat each track, challenge friends to a race or take on the Season mode and become the best driver on the circuit.